How to link Aadhaar Card to the Paytm Wallet? Well, our story shall decode all the steps for you so that you can complete your KYC with Paytm to avoid future consequences. Demonitisation lead to many new changes in our country. The latest one was- link Aadhaar card to Paytm to complete the KYC process and authenticate the user. As per the new RBI guidelines on electronic wallets or e-wallets it has now become customary for all the wallet providers to get the KYC done for their users. RBI believes that a full stop will be put to crimes like identity theft, fraud and money with this step. It will also be beneficial for the financial system making it safer than before. The new RBI guidelines mandate to link Aadhaar to Paytm for KYC completion. 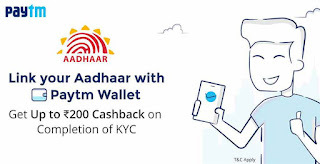 Read on the details and get your KYC done right away as linking Aadhaar card to Paytm wallet shall make you an authenticate user. New users will have to compulsorily provide the required KYC details for completion of minimum KYC during the sign up. For minimum KYC the customers are required to provide their valid ID card details. By fulfilling them minimum KYC requirement the customers will be able use their account. However until the full KYC process is complete the customers will not be able to keep more than Rs.10,000 in their wallet also they will not be able to send money to other wallets or bank accounts. The new users will also have to complete the entire KYC process and link Aadhaar to Paytm for KYC completion within 12 months of furnishing the minimum KYC details. After entering your details the agents will ask you for your fingerprints in order to complete the KYC through biometrics process. A full KYC verified user of Paytm enjoys the liberty keep the balance of wallet up to Rs.1 lakh rupees and enjoy unlimited spending throughout the month. Whereas the users with minimum KYC details can enjoy a wallet balance limit of Rs. 10,000 and monthly spending limit of Rs. 10,000 only. Users who have completed the entire KYC process can easily transfer money to other wallets and bank accounts. A fully verified KYC user has the liberty to open a savings account with Paytm Payment Bank and earn interests on their savings. Paytm Payment Banks have a number of benefits like zero minimum balance, zero digital transaction fees, and others. Fully verified KYC users can also access a number of discounts and offers by Paytm. In order to complete the KYC application with Paytm a Paytm user will have to visit the nearest Paytm KYC center. The customer will get the documents verified at the nearest Paytm KYC center. But the issue that arises out of here is that how will one get to know about the nearest KYC Paytm center. Apart from this when you are out for shopping it becomes difficult for one to locate the stores that accept payment via Paytm. But you need not worry anymore, the Paytm App has the solution to all your problems related to finding the nearest KYC center. 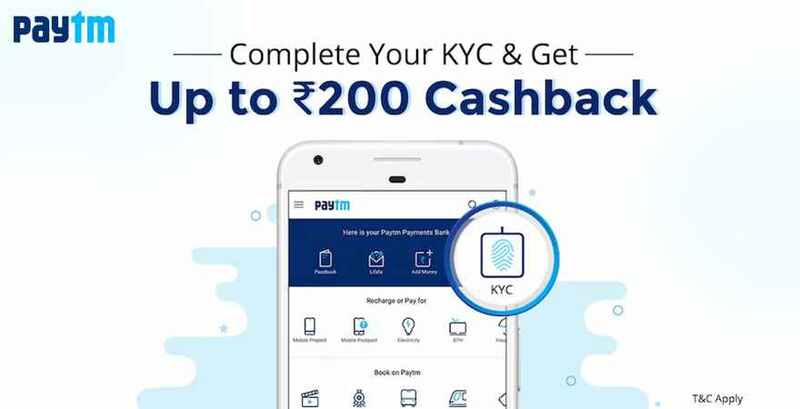 Here is a stepwise guide to help you find the nearest Paytm KYC center. The first thing one needs to do in order to find the nearest KYC center is to switch on the location of your phone. Next, you will have to open your Paytm App. Now you will get the option for ‘Nearby KYC Point’. Apart from this you can also go to the ‘Menu’ option and click on ‘Nearby KYC Point’ to get to know about the nearest Paytm center. If you are willing to complete your KYC you can choose the first option and a list of all the nearby Paytm KYC centers will appear on your screen. On the other hand, if you wish to know about the vendors accepting Paytm around you. You can choose the second option. Getting to know the nearby KYC center is not as difficult as it seems to be. So complete your KYC as soon as possible and enjoy hassle-free online payment experience. 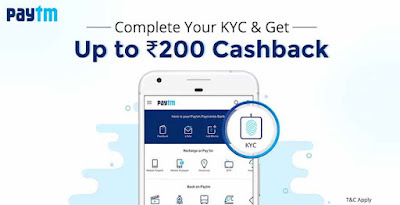 Paytm offers Rs.200 cashback on linking your Aadhaar with Paytm wallet for the completion of KYC process. 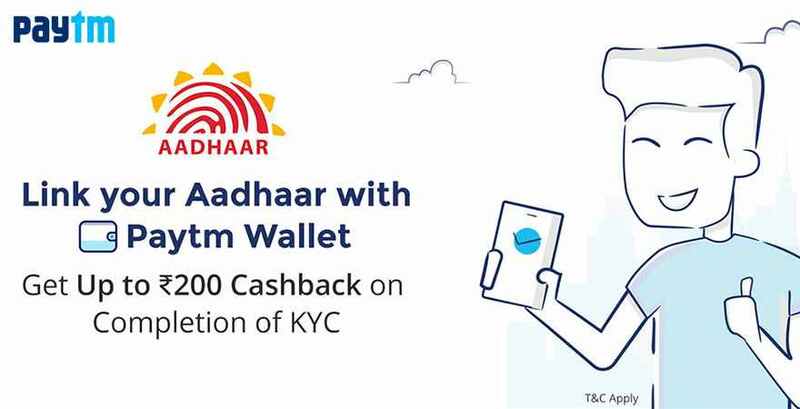 To enjoy these benefits link Aadhaar to Paytm for KYC completion today!